Today was Jack’s first class trip. Each parent brought their own child(ren) so it wasn’t as much of a teacher controlled group as it was parent controlled. 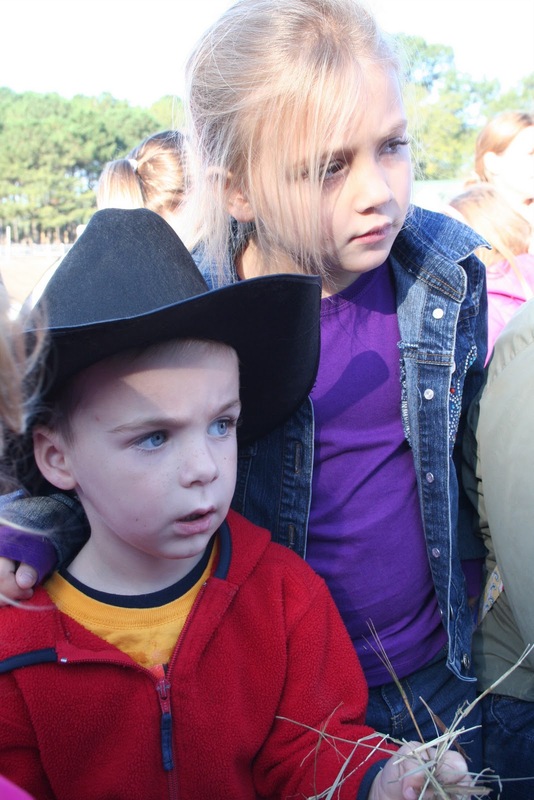 We headed to Hunt Club Farm for a hayride, petting zoo and to pick out a pumpkin. Casey came along too. 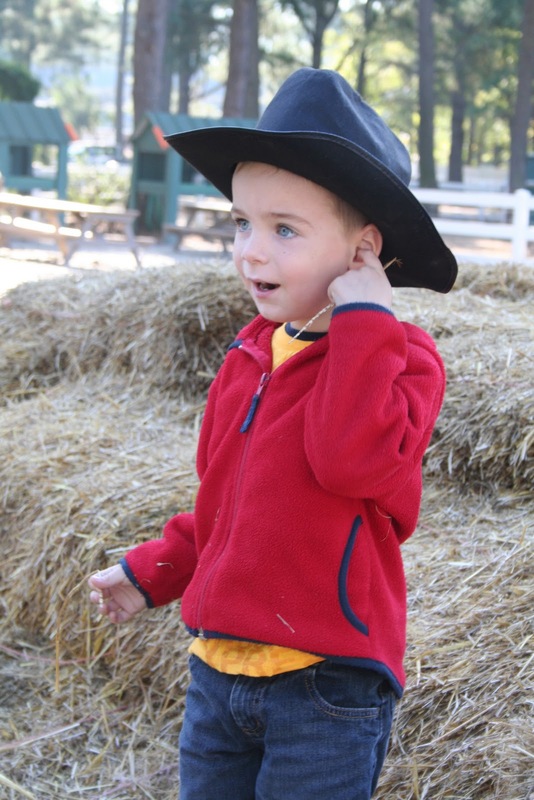 Jack told me last night that we were going to have to get up early and eat our breakfast quickly and brush our teeth quickly so we could get to the pumpkin patch on time. We did have to leave the house a little earlier than normal but with Casey waking up well before the hour of 7 lately (another post entirely) there was no fear of being late. In fact, she watched a show, ate her breakfast and then went upstairs to wake up Jack despite directions to the contrary. Even though I was pretty sure I wasn’t going to oversleep, I woke up 4 or 5 times during the night to check the time so we wouldn’t be late for Jack’s big pumpkin day. 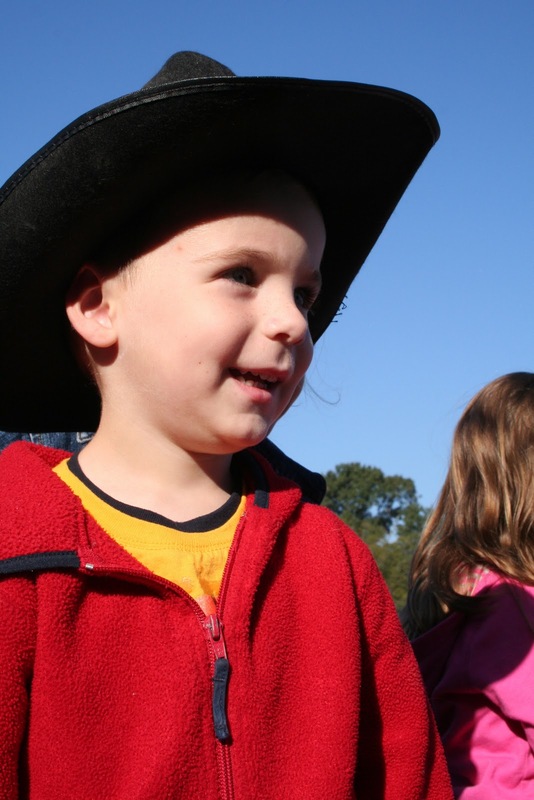 Jack wanted to wear his cowboy hat to the farm. I was a little reluctant to let him at first, mostly because I figured I would be carrying it around instead of him. 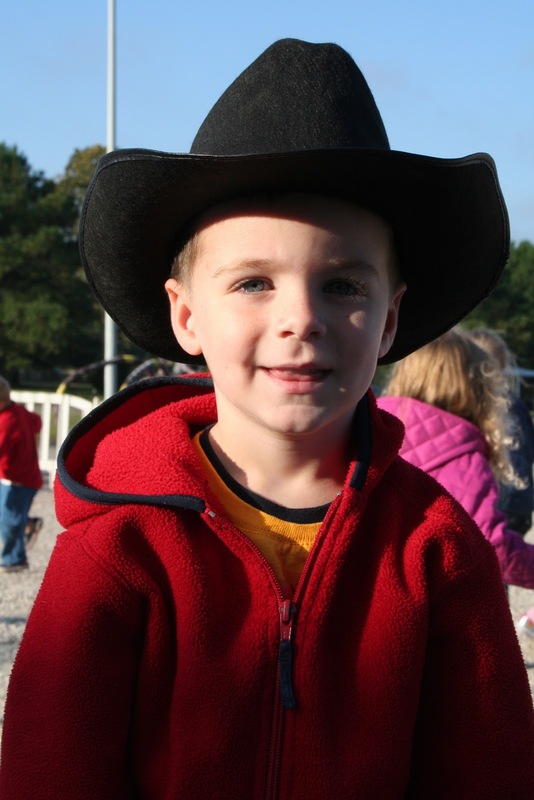 But, since we won’t be heading to the ranch any time soon, what better place to wear his cowboy hat than to the farm. I was looking forward to seeing Jack interact with his classmates. He’s been talking about his friend M. since school started and I thought they would have a great time together. However, as we were gathering at the farm, the girls in Jack’s class all got together and started talking and running around and the boys clung to their mothers. 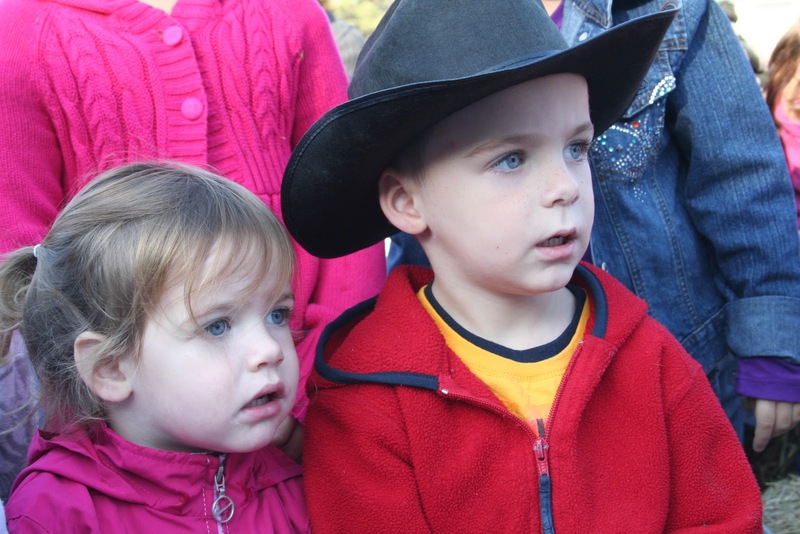 The hayride wasn’t so great for the kids. We put most of the kids in the middle of the wagon and then realized that they couldn’t see anything because all the adults were sitting around them on the outside. We were all squished in there so there wasn’t any room to switch places. 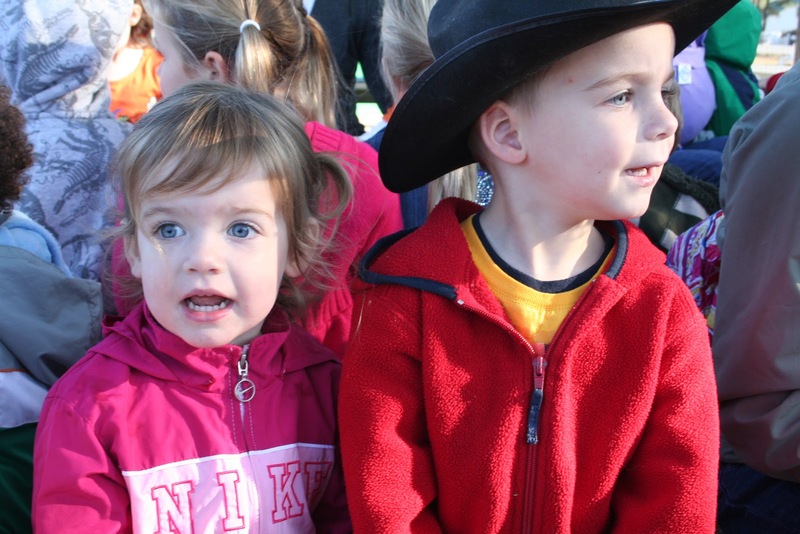 They got to see the horses and the lady who talked all about pumpkins and gourds so they were happy enough. 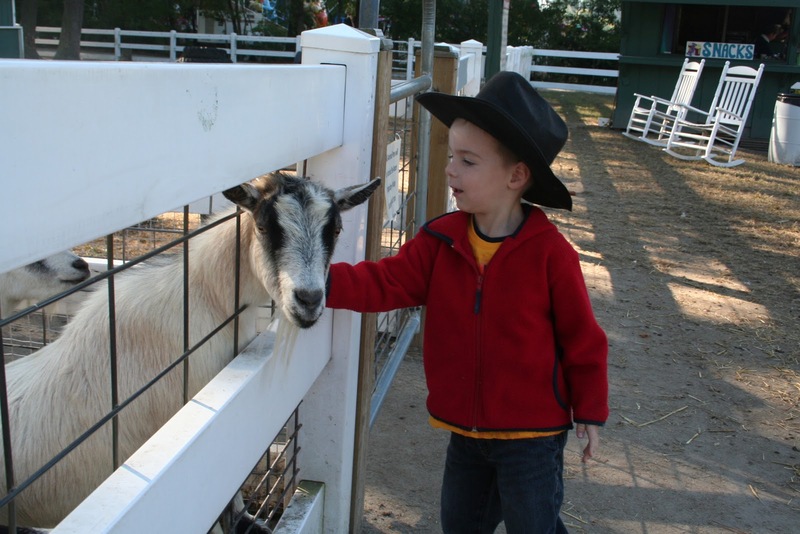 Then we were off to the petting zoo and playground. 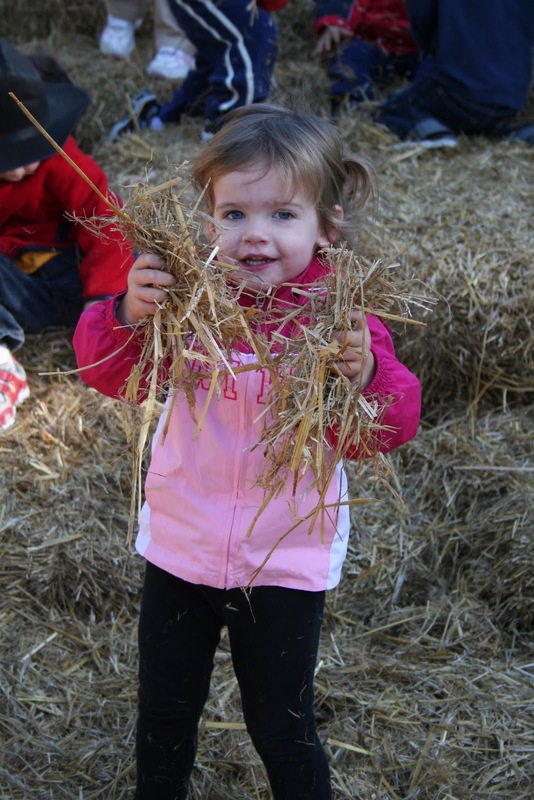 First they ran to the top of the haystack and had a great time jumping around in there. Then we went to visit some chickens and goats. 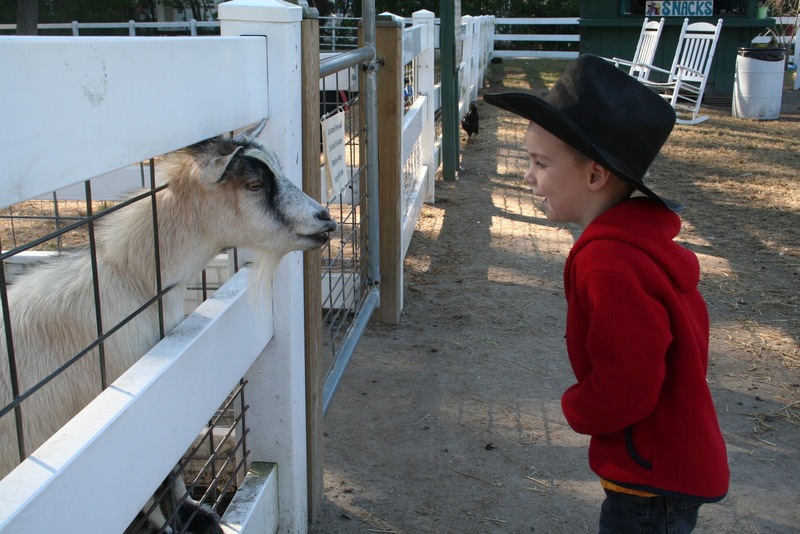 Jack loved the goats. He could pet them through the fence and he thought they really liked him. He kept showing me the best way to pet them. They all had cute little nametags on and the ones that Jack liked best were named Jack and Jill. Yeah, the goats had cute nametags. Anyway. 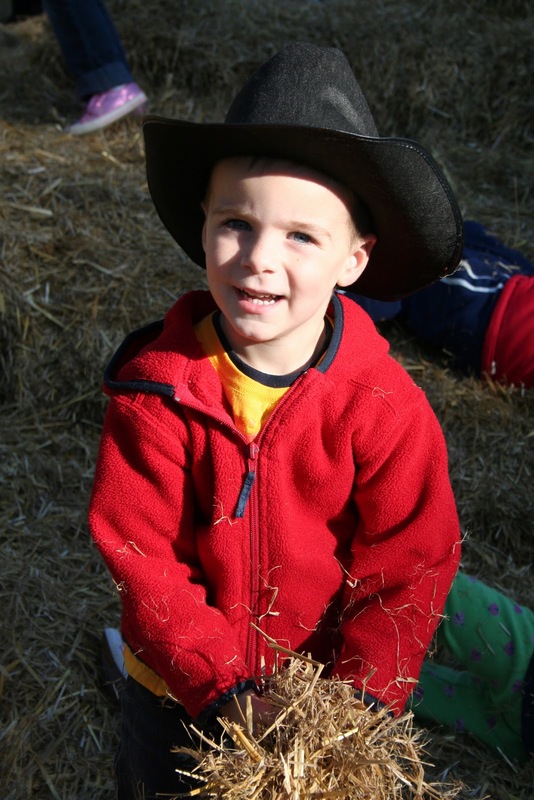 We did a class picture and a little more haystack climbing and it was off to pick a pumpkin. 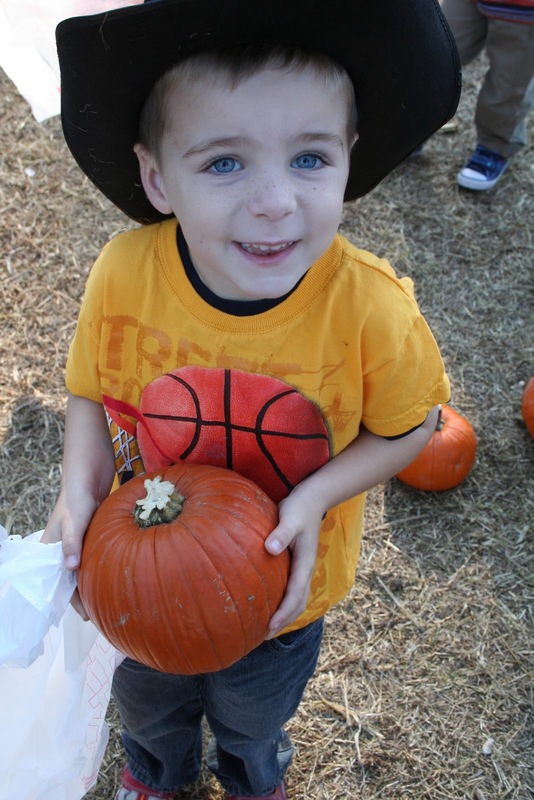 Jack kept telling me how he was going to pick the best pumpkin and he had all sorts of criteria for the ultimate pumpkin. As soon as we got to the pumpkin corner, he said, “That’s the one!” I thought the search was going to take much longer than a quarter of a second, but I guess fate intervened to prevent a long, drawn out pumpkin selection process. Most of the school left after picking pumpkins. 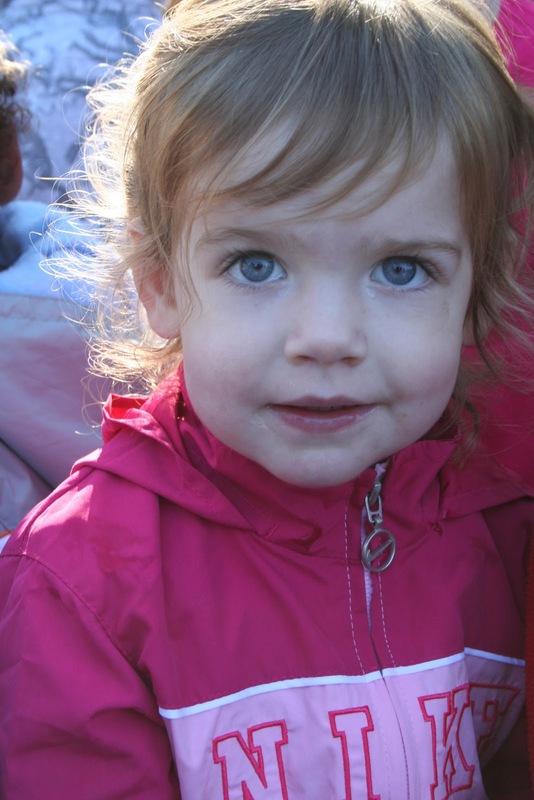 Casey was so cute and really wanted to show her pumpkin to Jack’s teacher so she went over and showed her. I think Casey thinks Miss H. is her teacher too. Casey had been begging to go on the playground back near the petting zoo so we headed over there for a little longer. Jack wanted to hang out with the goats a little longer too. 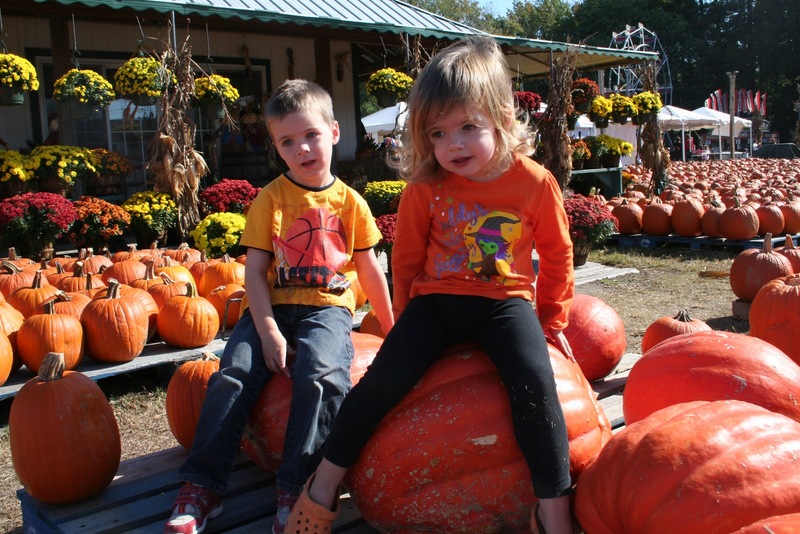 We finished our trip with me telling the kids that we weren’t buying any big pumpkins today. 10 or so times. I also told Jack that we could not plant his pumpkin seeds today. 5 or so times. We wandered through the big pumpkins, tried to get some pictures with them and then headed home. It was a fun trip but I might as well have taken them by myself for all that Jack interacted with his class. At least he sat nicely for a picture with his class!